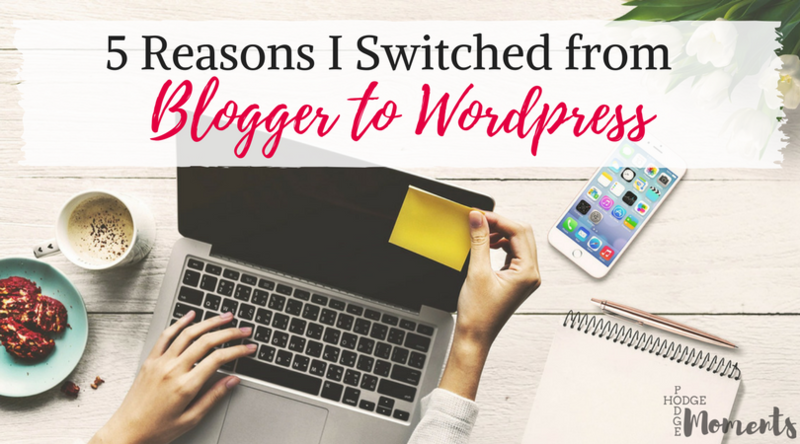 I’ve been talking about moving from Blogger to WordPress for at least a year now. This month, I finally decided to make the jump and commit to switching things over. I have to admit that it wasn’t as scary as I predicted. I’ll be sharing more details on how I moved everything over in a future post. 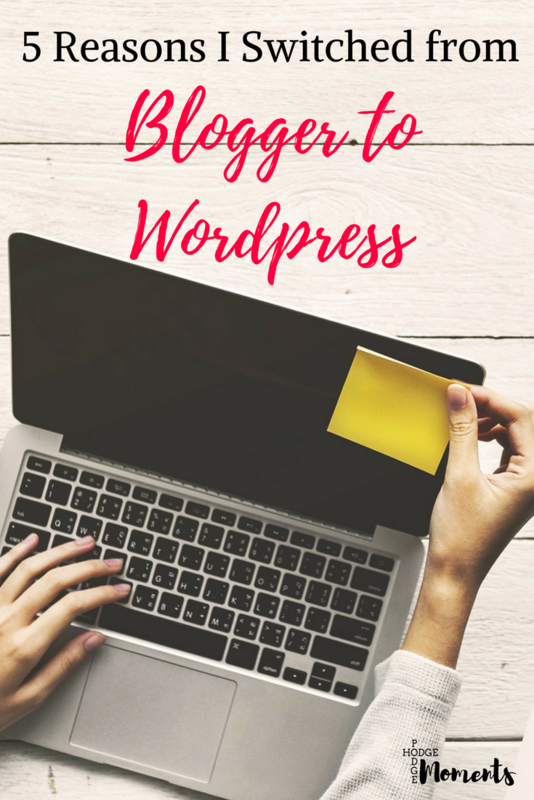 Today, I want to share the why behind moving from Blogger to WordPress when I started on Blogger and overall liked the platform. When I started my blog, I was looking for a hobby to distract me at the start of a long distance relationship filled with deployments. I predicted that it would last one summer and then fizzle out. So, I started with a free platform that I had played around with before – Blogger. I found it easy to set up and customize. As I started to network and connect with other bloggers, I found that my blog started to grow and I learned the ins and outs of Blogger as a result. Then, I started to learn even more about blogging and how some bloggers were able to monetize their blogs and bring home quite the paycheck. I became intrigued and dabbled around with making money a little bit. I didn’t make much since I wasn’t taking it seriously – a couple hundred here and there doing sponsored posts. I continued to blog and make connections online though. There were periods of growth and slumps. I was okay with this because my blog was just a hobby – a way to pass the time and make friends online. Then, something changed and I realized that I needed to shift my focus a bit. About a year ago, I became a mother to an adorable little boy. (I may be a little biased in that opinion.) I know it may sound cliche but he changed my outlook on a lot of things. We reviewed our finances and decided that it was to our advantage for me to stay home and raise him the way we’d like. It did make things a bit tighter though. We’re not eating scraps or anything, but we are a bit more conscious of our spending. During this time, I’ve realized that I miss not helping with the finances. I’ve always been able to provide for myself and contribute to our family and it feels like a part of me is missing without this. I’m sure you could analyze this and connect it to my money mindset, but the bottom line is that I’d like to contribute financially. I view my blog as the doorway to this opportunity. I mentioned above that I made a little bit of money while I was on Blogger. It was somewhere in the hundreds, but I never even broke the thousand mark in a given year. Part of this was due to the limitations that come with Blogger. Many ad networks and sponsors want you to have your own platform and when you’re with Blogger, you simply don’t own much about your blog. (I talk more about this in the ownership section below). I started learning and researching how to blog and make money in more depth and found that WordPress offers a lot of tools that can help. Almost every training that I invested in (including Blogcabulary and Blog by Number) pointed me towards WordPress and Siteground to start a blog. I was finally convinced and committed all the way. And let’s just say – it was easier and less expensive that I previously thought! I started with the topic of making money because it was what started me down the path towards WordPress. As I learned more, I realized that not only would the WordPress platform help me make money, but it could also help me grow. And since growth and money go hand in hand, this seemed like an important thing to consider. With Blogger, I could share my posts all day long and track them with Google analytics. The same is true with WordPress. The difference (and magic) is in the plug ins that WordPress allows you to use on your site. These plug ins can make a world of difference when it comes to promoting and sharing your posts with the world. They can allow you to add share buttons and other nifty features that encourage your readers to share things for you. I love playing with layouts and making things my own. In fact, I was quite skilled at making my Blogger blog look really nice. However, I was starting to notice that the blogs made with WordPress looked ten times better and more professional than my little blog. This is because WordPress allows you to do a lot more depending on the theme you’ve downloaded. After switching from Blogger to WordPress, I immediately started playing around with themes, menus, and a lot of the other nifty tools available to me. I was surprised at how easy it was to make things look the way I wanted them to look. I know I’ve only touched the surface of customizing the appearance of my blog and yet I’m already in love with this feature! I mentioned ownership a bit above but I’m going to go just a little further in depth. When you host your blog on Blogger, it is essentially the property of Google. This means that they can choose to shut down the blogging service at any time. It also means that they can choose to use your work to represent them. If you dig through the terms and conditions, you’ll find some surprising phrases about how they can use your work. You still maintain ownership but they are essentially in control. With WordPress, you have full ownership of your site. If your hosting company shuts down, your site is still available to access. Many affiliate programs prefer that you have your own hosting before you can work with them. Hosting with Siteground and using WordPress to set up your blog allows you to have full ownership of your work, how it is displayed, and what happens to it after it’s displayed. You are the one in control of your stuff. The biggest reason I switched is because of intuition. Something deep down inside told me that the time was right and I needed to move forward. This was one of those “listen to your heart” moments and I fully believe in following those when they come along. WordPress was popping up everywhere and my heart said it was time to go for it. So, I took the leap and I’m so glad that I did. Have you ever switched a blog from Blogger to WordPress? Have you ever followed your heart and made a big change in your life? I’d love to hear about the experience below!